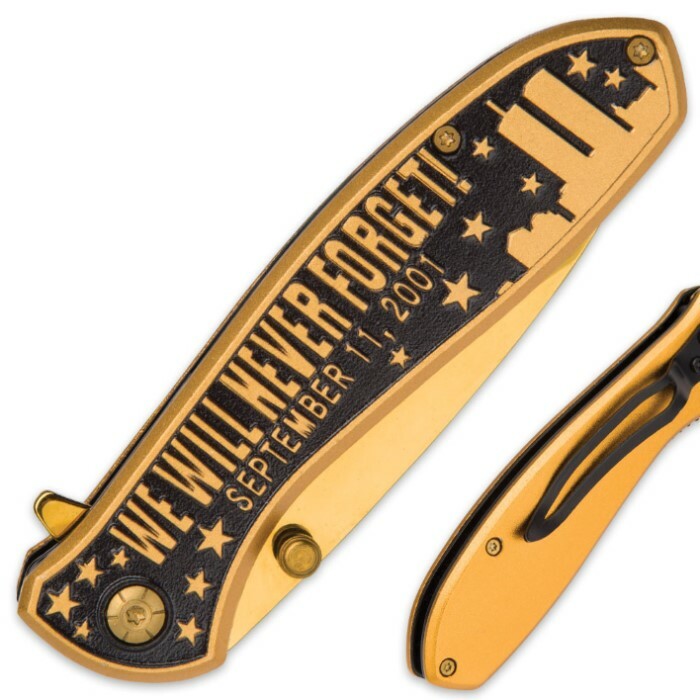 We Will Never Forget 9/11 Tribute Assisted Opening Pocket Knife / Folder - 420 Stainless Steel, Gold Finish - Everyday Carry, Display, Collectible, Gift - World Trade Center Twin Towers New York NYC | BUDK.com - Knives & Swords At The Lowest Prices! 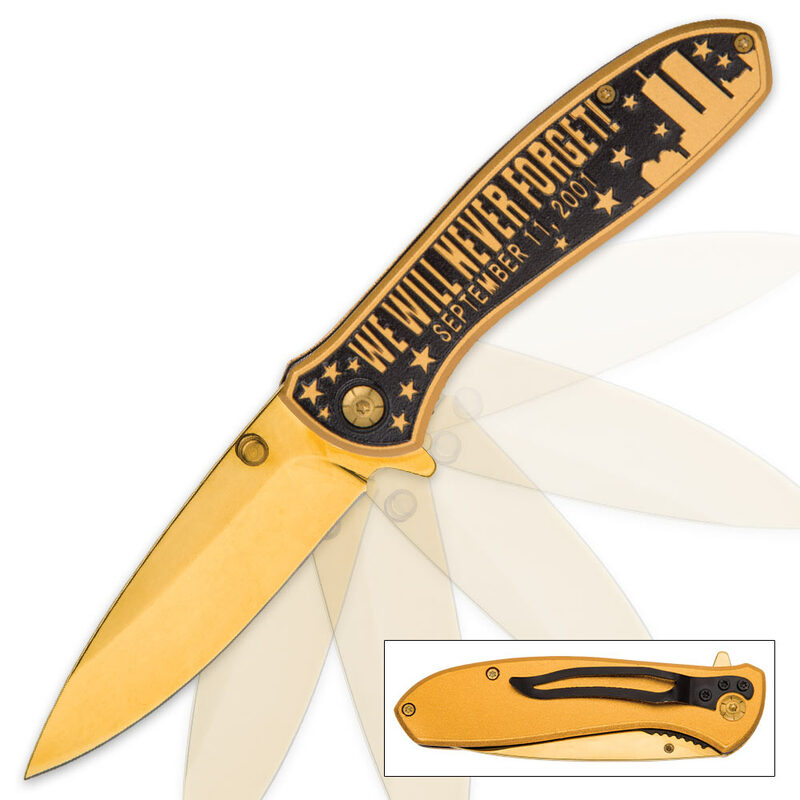 Exquisitely detailed and bathed in a vibrant golden hue, this eye-catching assisted opening pocket knife adds beauty and charm to any cutlery collection, while serving as a poignant reminder of the tragic events of Sept. 11, 2001. The handle's breathtaking relief graphics honor the memory of those who lost their lives in the 9/11 terrorist attack on the World Trade Center in New York, NY. "We will never forget!" is emblazoned across the handle in large, raised golden lettering, flanked by a golden silhouette of the WTC Twin Towers and surrounding NYC skyline. The bold imagery pops vibrantly against a black background studded with stars. Alluring and moving, though it is, this distinctive folder is more than just a showpiece, however. 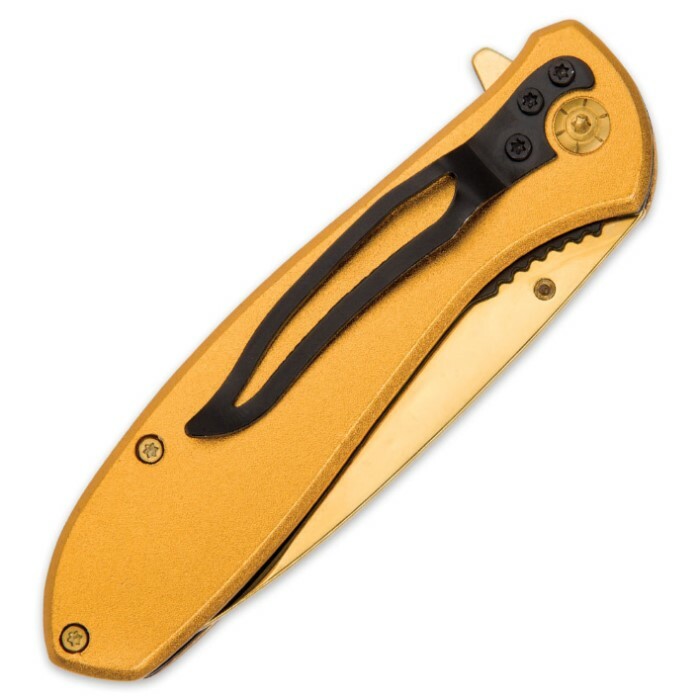 It's also field-capable and exceptionally tough, with its durable, corrosion resistant aluminum handle construction and resilient, gold-finished 420 stainless steel drop point blade. Fast, one-handed blade deployment is a breeze, thanks to the velvety smooth assisted opening mechanism and accompanying blade spur / flipper and ambidextrous thumb studs. Once open, the sturdy frame lock keeps the blade fixed in position for added safety and stability during use. Best of all, this outstanding folder represents a tremendous value! Pocket knives this well-crafted, beautifully designed and ruggedly built often cost two, three, even four times as much elsewhere. Furthermore, you can't find this exclusive, heartfelt design anywhere else. So order today, before they're all gone or, better still, get two, three or more - one to carry, one to display and one to gift! At this price, it's painless; most importantly, however, it's a great way to show your patriotism and solidarity with the brave victims of 9/11 and their loved ones.